Wabi-Sabi is a Japanese concept with various interpretations but those that resonate deeply are rustic elegance, quiet taste, refined beauty and the belief that objects gain value through use and age. Wabi-Sabi is authentic, unpretentious and connected to nature. Its values were influential when we established Wabi-Sabi Japan and continue to inspire us today. Our passion is to provide intimate experiences in areas of Japan never frequented by foreign travellers or domestic tour groups. In the more remote regions our extensive knowledge of hidden routes and special relationships with local friends allow our guests to explore a traditional way of life that even most Japanese have not observed. 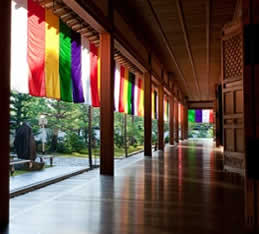 This does not mean we don’t appreciate the vibrancy of Tokyo or the charms of historic Kyoto. It does mean our insider access enables you to see aspects of those cities visitors rarely witness. We also understand that hospitality is a refined art in Japan and for some the most vivid memories will be of exclusive ryokans (luxurious traditional inns), private hot spring baths and the subtle flavours of intricately presented meals. "By learning to serve so well that you no longer need to think about what you are doing, you are free to focus on your guests."